Alibaba Group hopes to make a dent in Google’s dominance of China’s smartphone market, and has high hopes that handsets running the company’s mobile OS will reach sales of 30 million units. The Chinese e-commerce giant wants to popularize its Linux-based Alibaba Mobile Operating System (AMOS) after the OS collided with Google last year. The U.S. search giant contends that the OS is a variant of its Android OS, but built with software incompatibilities. This set off a dispute that has threatened to drive away top Android handset makers from using Alibaba’s still-fledgling OS. Despite the setback, Alibaba in April partnered with six Chinese handset makers to launch five smartphones running its OS. Although none of the handset makers are major names, the company is seeing growing interest from vendors that want an alternative to Android. 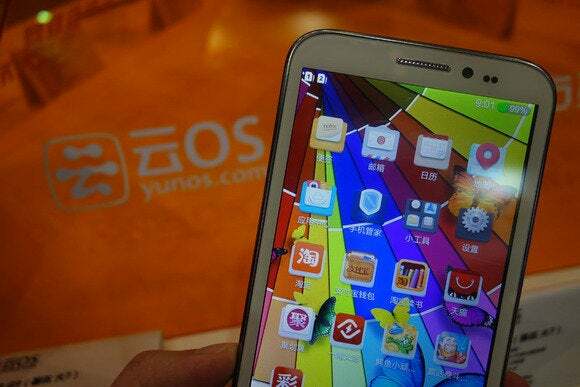 To encourage vendors to sign up with the OS, the company is also subsidizing handset makers with a monthly 1 yuan (US$0.16) payment for every Alibaba OS smartphone sold. The payment is ongoing until a handset makers’ phone goes out of use. In addition, Alibaba is promoting the handsets with its online retail sites. The latest slate of handsets to use Alibaba’s OS had pre-orders reaching 30,000 units, according to one of the company’s websites for the phones. “These phone manufacturers have no experience in e-commerce, and they are not branded names in China. So considering that, it’s a very big number,” he said. But Alibaba has no plans to go into the handset business, or acquire a local smartphone vendor. Instead, Wang believes the company can effectively partner with handset vendors to offer innovative products. One such vendor, called Green Orange, wants to sell personalized phones to consumers, allowing them to pick and choose what features they want, he said. The completed phone would arrive seven days later. China’s homegrown mobile OSes made up less than 1 percent of the country’s market last year, according to a research division of China’s tech regulator. In contrast, Google’s Android had an 86 percent share.